What a lovely little gem. 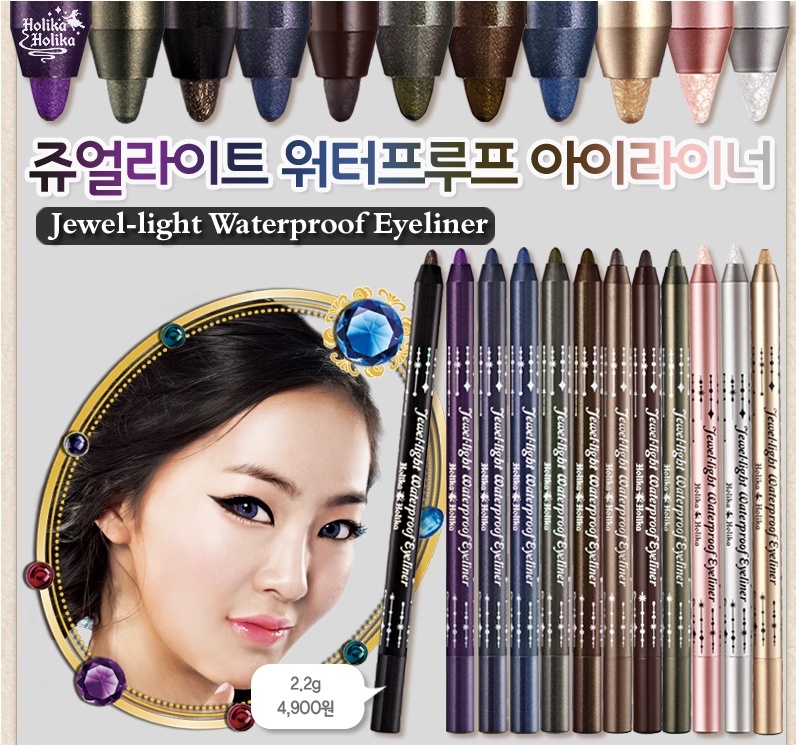 These Jewel-light Waterproof Eyeliner pencils from Holika Holika are so great. One might even say that they are highly comparable to or as good as Urban Decay 24/7 Eyeliners, which are really popular but on the expensive side. They are made by South Korean brand Holika Holika. Packaging is of course adorable carrying on the theme of ''magic'' and little, cute witch on the packaging throughout the range of products. I have bought mine online from www.ebay.co.uk for about £3.52 each with free postage. Great bargain! The colours I picked are; 01 Black Gem (matte black, great for tight lining the waterline), 02 Black Crystal (multicoloured fine shimmer), 03 Lapis Lazuli (dark blue with fine blue shimmer) and number 11 (light brown with bronze shimmer). All colours are gorgeous, richly pigmented and shimmer has no fallout. Texture is creamy, glides on like gel eyeliner. Their main selling feature is that they are really waterproof. I tested it by applying them on my hands and washing my hands with soap and water. Colour did not smudge a bit. To remove it you only need eye makeup remover. They need ordinary sharpner to tidy up the tip. The good tip to remember while using these eyeliners is to apply them on the eyelids (or waterline) and let it dry for few seconds. After the colour dries it just stays on for hours. They can be used as eye shadows too by smudging the colour on the eyelids before it dries. Have you tried Jewel-light Waterproof Eyeliner pencils too?